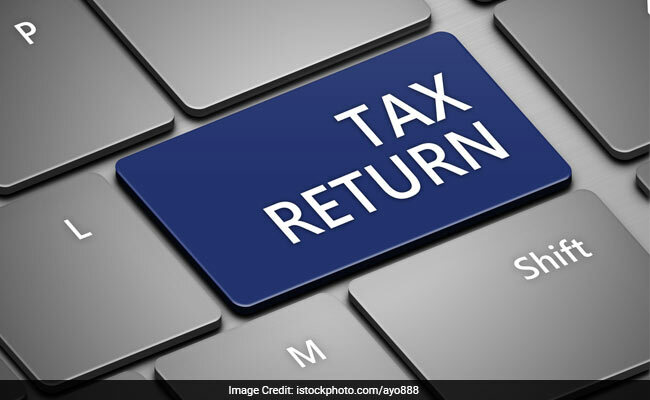 There are two ways to file income tax return (ITR) online. Online filing of ITR is very convenient and also ensures the secrecy of your personal information. The government has extended the deadline for filing income tax return to August 5. Online filing of income tax return is very convenient and also ensures the secrecy of your personal information. There are two ways to file the ITR online. Under one method you can download the applicable form from the income tax website, fill the form offline, save it, generate an XML file and then upload it. 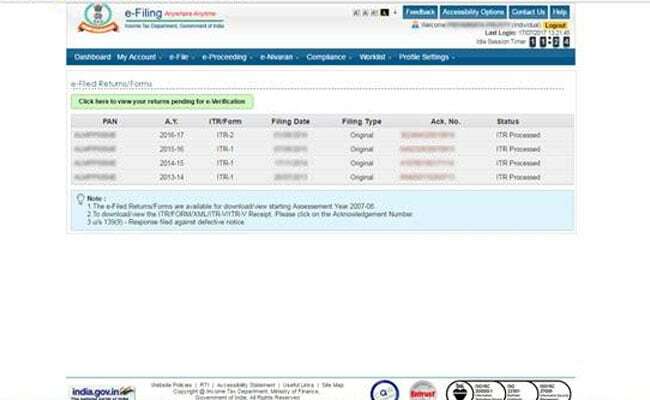 Another method to file ITR online is to enter the relevant data directly in an online form and then submit it. The second method is applicable for ITR 1 and ITR 4 forms only. 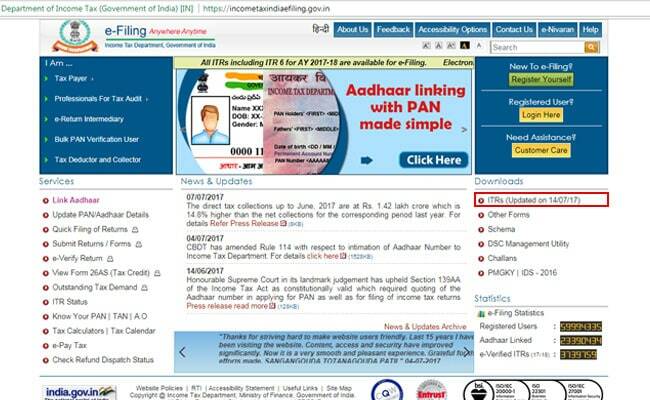 1) Visit income tax e-filling website. On the right-hand side under the 'downloads' section, click on ITRs. It will redirect you to a new page where you will get all the ITR forms available. Depending on the category you fit in, you need to click on the relevant form. All forms are available in two alternative formats - Excel, Java-under the download button. You can choose the format (Excel or Java) you are comfortable in. 2) Once you download the excel form, first fill the details asked in red, as these are mandatory. Remember that only green cells in the Excel sheet are for data entry. While entering data in the green cells, do not use shortcuts (like CTRL X/CTRL V/CTRL C or cut/copy/paste). In the form, some fields are automated, which are in white. After you fill all the relevant details in the Excel form, click on the 'validate' button on the right-hand top to ensure all the relevant sections have been filled. However, you need to activate 'Macros' and 'Active x' functions in your excel workbook for the side buttons like 'validate' to work properly. These functions can be activated from the 'File" menu of your excel sheet (File > Excel options > Trust Centre >Trust Centre Settings > Macro Settings > Enable All Macro > Click 'OK'). 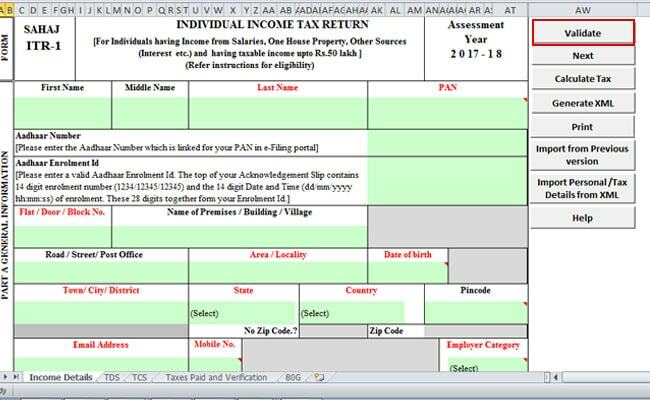 3) In the ITR form there are five sheets- Income Details, TDS, TCS, taxes paid and verification and 80G. You need to fill each sheet depending on the income category applicable to you. After you fill all the information in the different worksheets of the excel form, save the sheet and then click on the 'Generate XML' button to generate XML version of the return form. After you generate the XML file, cross check all the information to ensure that you have filled them correctly. 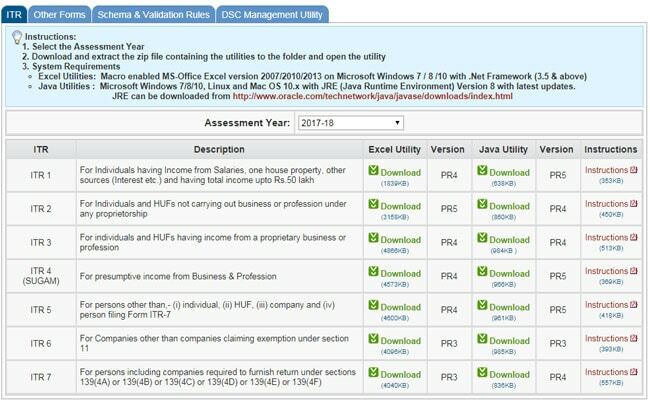 4) After you generate the XML file, you need to upload the return on the income tax website. If you are already registered on the efilling website, then click on 'Login Here' button on the right-hand top otherwise click on 'Register Yourself' button and register yourself by providing all relevant details. 5) After you complete your registration, login to your account by providing your PAN number, password. After you log in, click on the 'e-file' button and select 'upload return'. A new page will open, where your PAN will be automatically reflected. Select assessment year, ITR form name then attach the ITR XML file. If you have digital signature, then select the 'digital signature' option and click on the 'Submit' button. The website will ask you to upload the pre-registered signature. Once the signature is uploaded successfully, the process of submitting ITR online is completed. The acknowledgement receipt will be sent to your registered email id. 6) If you don't have digital signature, then you need to verify your return using one of the options provided by the income tax department. After you verify your return, your online income tax return process is completed. Now, you can go to 'My Account tab' tab and click 'View e-filed returns/Forms' option. Here you can see the status of all the returns uploaded and filed (old and new) by you along with the status (processed, uploaded or pending for e-verification).